Hycon Hydraulic Systems provides quality assured repair services for the pumps, valves and motors used in high performance hydraulic systems. We are a family owned and operated business established more than 30 years ago. Our commitment to quality, rigorous testing and specialist equipment has made Hycon Hydraulic Systems a preferred supplier to Australia’s contract mining, construction and forestry industries. We stock parts and repair hydraulic components manufactured by Kawasaki, Linde, Denison, Parker, Rexroth, Hagglunds and Sunstrand which are used in equipment made by Atlas Copco, Case, Caterpillar, Daewoo, Doosan, Drilltech, Hitachi, Hyundai, JCB, Kobelco, Komatsu, Liebherr, Sumitomo, Terex and Volvo. 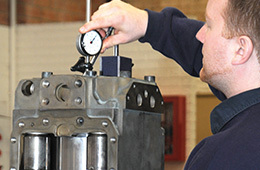 Hycon Hydraulic Systems provides a comprehensive in-house service that is fully quality assured. At every stage of the repair process the company’s quality assurance system tracks the work undertaken, ensuring integrity of the finished product. All repaired components are thoroughly tested to full capacity, with performance results logged and checked to verify their conformance to manufacturers’ specifications. Hycon Hydraulics Systems first gained quality certification in 1996, and is currently certified to AS/NZ/ISO 9001:2008. The firm’s management is committed to continuous improvement and ongoing training of personnel to maintain and further improve quality standards. 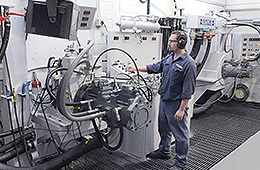 To ensure customers enjoy smooth operations and minimal machine down time, Hycon Hydraulic Systems offer service exchange hydraulic components. 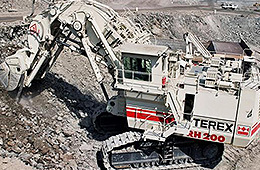 Service Exchange is available for Hitachi, Liebherr and O&K mining excavators. For more information on the service exchange components we have available click here. Hycon warranties generally exceed the manufacturers’ original warranty. All components are rebuilt to exacting specifications and we only use genuine replacement parts. This ensures a working life equal to the original equipment manufacturers’ specifications. 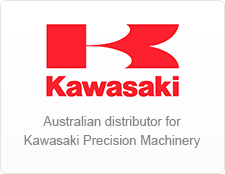 Kawasaki hydraulic pumps and components. Denison hydraulics pumps, valves and motors.